Please read: A note to the student. 1) A "WebAssign access code". You can purchase the Webassign access code (which automatically includes the ebook -- but not the paper textbook) directly from the publisher at this custom Cengage website. >Do NOT "Purchase Access Online" when you log on to Webassign directly -- follow the above link instead. >This is the lowest cost option -- there is no option to buy a Webassign access code without the ebook. the Webassign code for that class. 2) A Ti-30x IIS Calculator -- $14.95 at the bookstore. This is the ONLY calculator model allowed on exams, in all our Calculus classes. Recommended: The textbook for the course is "Calculus, 8th Edition, Early Transcendentals" by Stewart. An electronic version is included with your purchase of a WebAssign access code, so a paper copy is not required. However, we do recommend that you read the textbook, and a paper copy will make that easier. An older paper copy (6th, 7th, or 8th edition) will serve just as well, and will cost significantly less. Some smaller, custom versions of this textbook (volume 1 covers both Math124 and Math125) may be available at the UW bookstore for $30-$40. Alternatively, you can buy both the new custom paper textbook that covers Math 124/125 and the Webassign access code as a bundle at the University Bookstore for about $135. HOMEWORK: All homework is accessible and turned in online using WebAssign. To sign in to WebAssign, do NOT go to the main WebAssign website. a special WebAssign portal designed specifically for the University of Washington. You will use your UW Net ID to sign in. FINAL EXAM: There is a common final exam, given at 1:30pm - 4:20pm on Saturday afternoon, the day immediately after the last day of class. See Date, Ground Rules, and Rooms for more information. 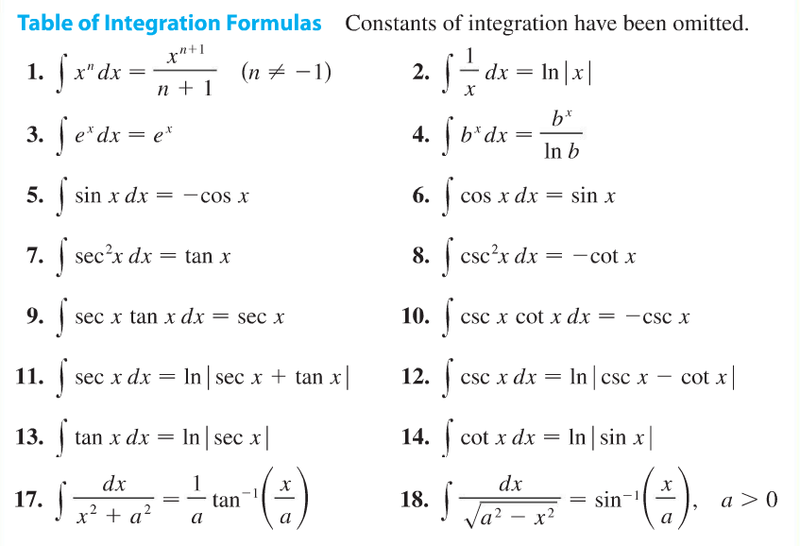 Table of Integrals: During the final exam, you may use directly any of the integral formulas in the table below. All other integrals must be computed from these. Calculator policy: The Ti-30x IIS is the only calculator allowed on exams in Math 125. Math 124/5/6 Median GRADE POLICY: Since Autumn 2012 the Department of Mathematics has adopted a grade policy for this course. The median course grades for each lecture section (or a single instructor's combined lecture sections) of Math 124/5/6 taught during the regular academic year will fall within the range of 2.9 +/- 0.2. This policy may not apply to the online sections of Math 124/5/6. Use Notify.UW to check for openings online, which are filled on a first-come/first-served basis. During the first week, the enrollment status of a class can change hourly; it really pays off to check frequently. There are no overloads or waiting lists. In most quarters almost all persistent students who want to take the course will find an opening sooner or later (but after the first week there may be a late fee). Whether or not you are officially enrolled, you should choose a class and start attending both lectures and quiz sections from the very first day. You should do any worksheets or quizzes. You will NOT be able to access homework until you are officially enrolled in the class. Important material is covered in the first week, and it is necessary to be in class and do the work during this period. All students are graded in the same way, and no student is excused from the first week's work. Students who cannot enroll in an on-campus section of Math 125 may register for the online section of Math125, which features online videos based on an on-campus section of the course. This section has exactly the same syllabus, textbook, and homework assignments as all other sections. Registered students must take two in-person midterms, and the same common final as the on-campus sections of Math 125. 6 Outline 6 More Techniques: Trigonometric Substitution, Partial Fractions, Combining Methods. 7 Outline 7 Approximation of Integrals; Improper Integrals; Applications: Arc Length of a Curve. 10 Outline 10 FINAL EXAM Archive More Diff Eqs; Catch up + Final Exam Review.